Should non-native species be screened at U.S. borders? Non-native plants and animals have invaded major areas of the United States, including the Great Lakes and Rocky Mountains, causing billions of dollars in damage yearly. Many imported species are harmless in new locations, but some thrive, altering ecosystems and killing off native wildlife. 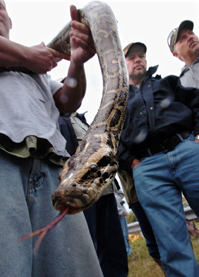 In the Florida Everglades, thousands of Burmese pythons — many the progeny of pets released illegally by owners — are devouring native animals, and wildlife officials are at a loss as to how to eradicate the giant snakes. Moreover, climate change has allowed both non-native and native species, such as the Western bark beetle, to spread at high rates and cause widespread environmental damage. To stem the tide of invasive species, conservationists want to tighten U.S. import laws. But the exotic pet industry — a major source of invasives — argues that stricter laws would undercut private rights. Meanwhile regulators with limited resources face hard choices about which species to control.